Fluke Tix520 infrared camera is an ideal choice of professional technicians because it allow thermographers to navigate over, around and under objects to preview and capture images.It is the one of the creative addition to the thermal imaging camera line which combines the form factor and its lens is able to rotate 180° independently from the display to take measurements in hard-to-reach areas. We can easily analyze, understand and communicate infrared images with the help of this technology. It basically links a thermal image with a real -world visual image.The imager automatically captures an infrared image with a visible image to show exactly the portion where the problem occurs and allows you to communicate it with others. Fluke Tix520 infrared camera are handheld infrared imaging cameras used in various applications like building diagnostics,research and development etc.Here we are going through its special features, have a look over it. For tough shots, it has 180° articulating lens. 5.7 inch responsive LCD touchscreen for 320×240 infrared camera. Brilliant image quality with a spatial resolution of 320×240 infrared camera. Built in laser distance meter calculated the diatnce to your designated target upto 100 feet and displays the distance on image. LaserSharp auto focus capability utilizes the precision laser technology and focus your target with pinpoint accuracy. Connect to the largest network of the wireless test. Quick and easy in-field analysis with IR-fusion technology. Fluke TiX520 infrared camera has advanced focus options which make this camera faster day by day. The advanced focus systems in these cameras take in-focus images faster and easier providing premium image quality and precise temperature readings.These cameras calculate and display the distance to your specified target with its built-in laser distance meter functionality. Built-in laser meter calculates & displays the distance to your target. See and share images from the field and connect to the largest selection of wireless test and measurement tools with fluke connect app. Organize your measurement in one location and make better decisions faster. With articulating 180° lens, you can easily navigate over and under objects. Touchscreen LCD with on camera analytics for in field image analysis. 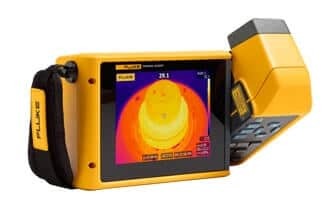 In this article,we provide a basic introduction of Fluke TiX520 infrared camera like its features, capabilities and accessories etc.Hope this article will help you.For any suggestions please share with us. We always appreciate your suggestions.